A central question in the study of quantitative phenotypic variation is the extent to which such variation is caused by genetic differences. The precise proportion of the phenotypic variance ascribable to genetic differences is formally known as the heritability. Many definitions of heritability have been proposed (Bell, 1977), but in this work we employ the narrow-sense heritability commonly denoted by h2 (Visscher et al, 2008). The concept of heritability was introduced by Fisher (1918) and Wright (1921) in their papers laying the foundations of quantitative genetics, although they did not use the word “heritability” in these early writings. Its success notwithstanding, the imminent demise of quantitative genetics as a field of research has been repeatedly predicted ever since its first textbook appeared (Falconer, 1960; Hill and Mackay, 2004). Perhaps the prominent role in quantitative-genetic theory of heritability—a macroscopic parameter of a genetic system—has led some to suppose that advancing microscopic knowledge of the genetics underlying a given trait will superannuate the high-level approach. This anticipated obsolescence has not occurred, and indeed the recent explosion of findings from genome-wide association studies (GWAS) has only intensified the spotlight on the concept of heritability. For example, the loci found to be associated with a given trait at a strict threshold of statistical significance typically account for only a small proportion of the trait's heritability (as estimated from traditional studies of the correlations between close relatives), and this discrepancy has led to much discussion of “missing heritability” (Manolio et al, 2009; Eyre-Walker, 2010; Dickson et al, 2010; Wray et al, 2011; Zuk et al, 2012; Gibson, 2012; Hemani et al, 2013). The estimation of heritability from the correlations between relatives has been substantially augmented by a novel technique that makes use of dense GWAS data from nominally unrelated individuals (Yang et al, 2010; Visscher et al, 2010; Lee et al, 2011). This technique is perhaps the most important innovation in quantitative genetics to have been introduced in the last dozen years, and it has provided what some may regard as decisive evidence for the view that undiscovered common variants account for a substantial portion of missing heritability. We will follow Benjamin et al (2012) and refer to this method as genomic-relatedness-matrix restricted maximum likelihood (GREML). The descriptions of GREML given in the literature suggest that the mathematical basis of this method is not fully understood. For instance, formal justifications of the method that have been offered so far seem unable to account for biased estimates occasionally observed in simulation studies. Here we attempt to further the mathematical understanding of GREML, thereby providing insight into cases where the method has not worked well. By revealing the sense in which these cases are extreme, however, our account conversely shows that GREML estimates are in fact quite robust. We treat the heritability of a single trait, but our account can be generalized to the genetic correlation between two traits. We emphasize here that some of our mathematical arguments employ restrictive assumptions about sample size, the number of genotyped markers, and the values of the variance components. However, the fact that certain assumptions are sufficient to prove a result does not imply that the assumptions are necessary, and later we provide strong evidence for the generality of our findings. We illustrate some of our mathematical arguments with numerical simulations, using two GWAS datasets to supply the genetic data. One dataset was used in a GWAS of European Americans reported previously (Chabris et al, 2013). The quality-control filters left 401 individuals and 661,108 markers (although only subsets of markers on chromosome 1 were used). We employed this small-sample dataset when it was necessary to relieve computational burden. The second dataset was taken from the GENEVA Genes and Environment Initiatives in Type 2 Diabetes (Nurses’ Health Study/Health Professionals Follow-Up Study). We used PLINK to eliminate individuals of reported non-European descent, markers missing more than 5 percent of their calls, markers showing significant deviation from Hardy-Weinberg equilibrium (HWE) (p < 1 × 10−6), markers with minor allele frequency (MAF) < 0.01, individuals missing more than 5 percent of their genotypes, and one individual from any pair with a relatedness (Eq. 5) exceeding 0.025 in absolute value; Zaitlen et al (2013) provide some discussion of the appropriate relatedness cutoff. These filters left 4,975 individuals and 697,709 markers. is the standard measure of linkage disequilibrium (LD) between i and j, and λ is chosen so that exp(−λdij) = .125 when i and j are 3 Mbp apart. SNP i's level of tagging by its neighbors is then the sum of the elements in the ith row of C. Large values of C correspond to strong tagging (redundancy), whereas small values correspond to a lack of LD with neighbors. distribution plus/minus 0.05, one random selection was made from the markers with MAF in the interval (0.01, 0.02), another from markers in the interval (0.245, 0.255), and yet another from the interval (0.49, 0.50) to create a set of three markers varying in MAF but matched with respect to LD. The extent of tagging by neighbors is moderately correlated with MAF, and there were no candidates for very strongly tagged markers meeting the initial requirement for low MAF. The right endpoint of the low-MAF interval was therefore extended by increments of .01 until the set of candidates was nonempty. We used GCTA to simulate phenotypes and estimate heritabilities on the basis of GREML. Each simulation scenario was tested with 200 replicates. where fk is the MAF at marker k. Note that the elements of u are not necessarily proportional to the average effects of gene substitution (Fisher, 1941; Lee and Chow, 2013), since a non-causal marker may have a nonzero coefficient because it is in LD with a causal locus that has not been genotyped. The phenotype need not be standardized, but it makes our presentation simpler. If we assume that linkage equilibrium (LE) holds approximately, then Z′Z ≈ nIp and the additive genetic variance is approximately u′u. will be multiplied by that constant (Speed et al, 2012). The average of the off-diagonal realized relatedness coefficients over all pairs is zero (Powell et al, 2010), and the diagonal elements of A converge to unity as p becomes large. The emergence of the matrix A from the action of the expectation operator in Eq. 4 implies that A is a constant (up to permutations of the sample) characterizing the population from which the n individuals have been drawn. The expectation must thus be interpreted as taken over random samples of size n sharing the same precise histogram of relatedness coefficients Aij but differing in the specific entries of e. In this way A is somewhat analogous to the sum of the squared differences between the independent variable and its mean (an ancillary statistic) in Fisher's (1973) discussion of univariate linear regression. Since fixing Z suffices to fix A, we henceforth assume that Z is fixed. This interpretation does not seem problematic; across distinct samples of large size n from the same population, genotyped with the same p-variant chip, histograms of relatedness coefficients with a reasonable shared bin width should exhibit little variability. and this is the issue that we address here. under the action of the expectation operator. There are two aspects of this assumption, however, that seem rather nonbiological. The first is that the number of markers with nonzero regression coefficients (“nonzeros”) is typically believed to be much smaller than the total number of genotyped markers (Park et al, 2011; Stahl et al, 2012), which is inconsistent with a normal distribution. Secondly and more importantly, the partial regression coefficients in u represent the average effects of gene substitution (or LD proxies for such effects) and thus cannot be said to vary randomly across individuals. Hence, while the spectrum of the coefficients could be described by a normal distribution or some other distribution, the exterior product uu′ cannot be averaged over this distribution characterizing markers when given as an input to an expectation operator over random residuals disturbing the phenotypes of individuals. This implies that uu′ is not proportional to the identity matrix. Note the contrast between the meaning of u in the GREML literature and in the treatment of linear mixed models by Lynch and Walsh (1998). For instance, in the example of Lynch and Walsh's Chapter 26, the elements of u are the breeding values of the pedigree founders and thus can properly be said to vary randomly across different realizations of the pedigree structure. If there are many genotyped markers, then u2 is a rather small quantity. If the nonzeros are a small fraction of the total, then most of the Δk are equal to −u2. If the kth marker has a nonzero coefficient, however, then its Δk has a relatively large positive value. We have already stated that the sum of Term 1 over all pairs of individuals is zero (i.e., the sum of Aij over i ≠ j is zero). Since the Δk are constants, the sum of Term 2 over all pairs is also zero. The sum of Term 3 over all pairs is zero as well because knowledge of randomly chosen individual i's genotype at marker k cannot provide any information about randomly chosen individual j's genotype at marker ℓ, even if k and ℓ are in perfect LD; only individual j's own genotype at k can provide this information. The results of calculating all three terms in Eq. 7 for each pair show that Term 2 is often comparable in magnitude to Term 1 and that Term 3 is frequently larger (Fig. 1). Increasing the number of markers from 100 to 1,000 only reinforced this conclusion. It is also of some interest to calculate the three terms in Eq. 7 using real data so as to examine the impact of LD. We therefore used the Chabris et al (2013) data to run simulations using distinct sets of 100 and 200 contiguous SNPs on chromosome 1. Each real SNP typically showed moderate to strong LD with neighbors, and there were pairs of SNPs with values of r2 exceeding 0.90. As can be seen in Fig. 2, the use of real data did not cause Terms 2 and 3 to vanish. Note that the average of each term was still close to zero. Boxplots of the three terms in Eq. 7 for pairs of simulated individuals and u. Red corresponds to Term 1, green to Term 2, and blue to Term 3. 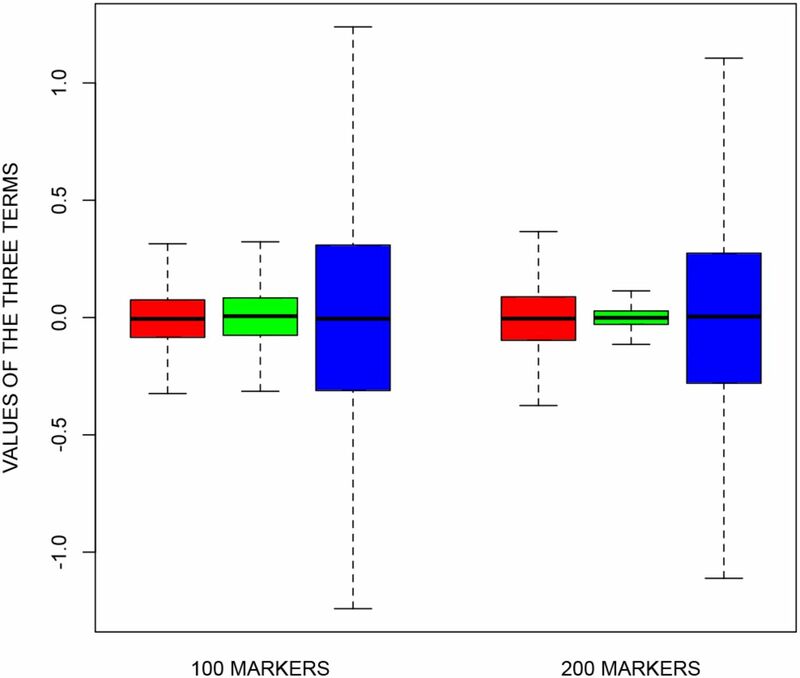 The plots on the left display the results for 100 markers in LE, whereas those on the right display the results for 1,000 markers in LE. Values lying beyond 1.5 times the interquartile range past either the 25th or 75th percentile are omitted. Note that the average of each term is close to zero. Boxplots of the three terms in Eq. 7 for pairs of real genotyped individuals (but simulated u). Red corresponds to Term 1, green to Term 2, and blue to Term 3. 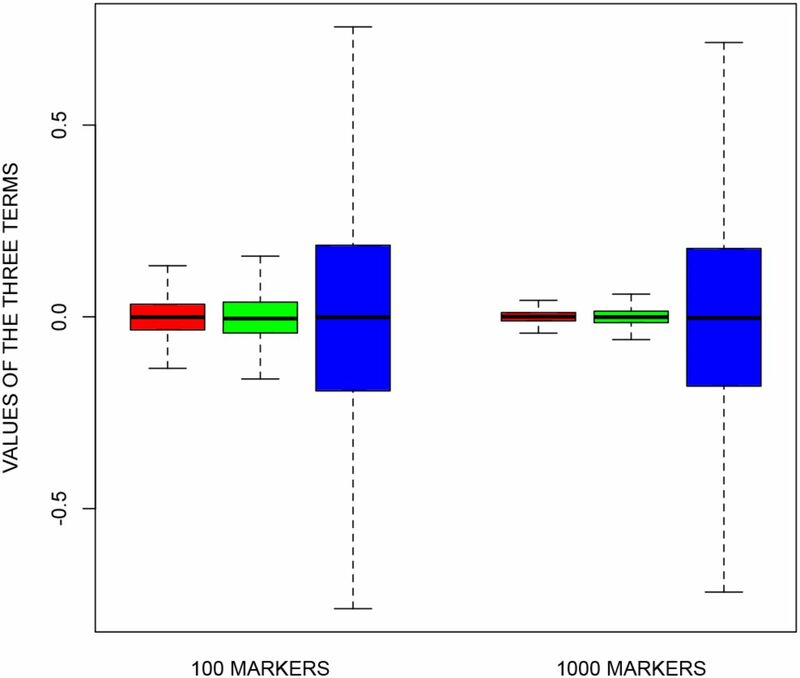 The plots on the left display the results for 100 contiguous genotyped markers on chromosome 1, whereas those on the right display the results for 200 such markers elsewhere on the same chromosome. Values lying beyond 1.5 times the interquartile range past either the 25th or 75th percentile are omitted. when applied to real genetic data (Speed et al, 2012, 2013; Zhou et al, 2013; Browning and Browning, 2013; Lee et al, 2013), which implies that the vanishing of the additional terms is not a necessary condition. Here we seek a more general characterization of those cases where GREML is accurate. and thus the sufficient conditions for Eq. 11 to give V−1 also ensure that the contribution of the last term to Eq. 16 dominates that of the first. the sum of these deviations over all individuals becomes zero. The off-diagonal contribution to Tr(AS) can be interpreted as (proportional to) a covariance between relatedness Aij and the sum of Terms 2 and 3, and this covariance must also be zero. There is a close analogy here to the requirement of a zero correlation between the causal variable and the residual disturbance for least-squares regression to provide an unbiased estimate of a linear causal effect. regime, GREML will accurately estimate the heritability captured by a set of independent markers even as the number of nonzeros decreases down to one. that may be nearly unbiased. To illustrate the impact of LD on the covariance between relatedness and Term 2, we performed simulations where each of 1,000 contiguous SNPs on chromosome 1 in the Chabris et al (2013) data was stipulated to be the single nonzero. Fig. 3 shows that there was a strong correlation, approaching unity, between the chosen nonzero's redundancy with neighboring SNPs (Eq. 1) and the resulting covariance between relatedness and Term 2. Because we used only a single nonzero in each simulation, Term 3 was trivially zero for all pairs and therefore did not need to be computed. The results displayed in Fig. 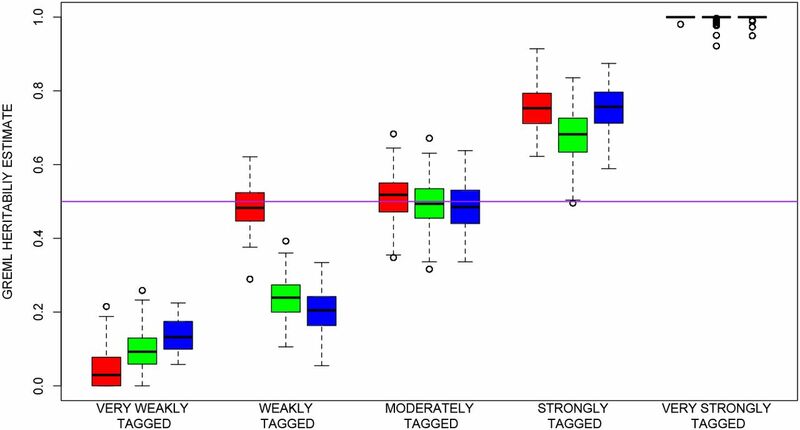 3 clearly bear out the fact that a clustering of nonzeros among the most (least) welltagged markers leads to a positive (negative) covariance between relatedness and the additional terms in Eq. 7. 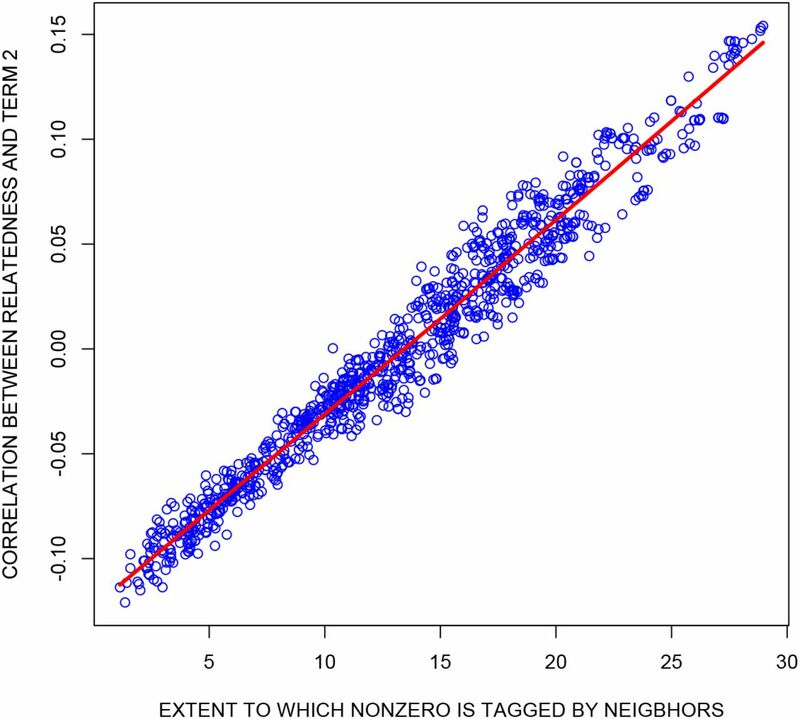 The strong relationship between the extent to which the simulated nonzero SNP is tagged by neighboring markers and the resulting correlation between relatedness (Eq. 5) and Term 2 (Eq. 7). Each point represents one of 1,000 contiguous genotyped SNPs on chromosome 1 in the dataset of Chabris et al (2013). The x-axis represents the sum of the elements in the row of C (Eq. 1) corresponding to the nonzero SNP, and the y-axis represents the correlation between relatedness and Term 2. The LOESS curve is displayed in red. The results displayed in Fig. 4 bear out our predictions. and closer to those observed at the other MAFs within our group of poorly tagged markers. estimates was 0.499 [95% CI = (0.487, 0.511)]. It is worth pointing out that we drew the magnitudes of the nonzero coefficients from a normal distribution. If the distribution is such that a few coefficients are much larger than others, than it is possible that chance unrepresentative tagging of the dominating nonzeros will lead to some bias. However, this potential problem does not seem too threatening in practice, because loci of large effect are relatively easy to detect and can be removed from the analysis. (attributable to variation in Z) from sample to sample. The figures of Speed et al (2012) and Zhou et al (2013) show very large standard deviations of heritability estimates in the case of few nonzeros because they varied the identities of the nonzeros across replicates. Across repeated studies of the same phenotype, where of course the identities of the nonzeros do not vary, it appears that GREML procedures produce robust standard errors after all. This condition in turn requires a zero correlation between relatedness and Sij. confirmed that such overrepresentation leads to a biasing of estimates in the expected direction. We have not discussed the potential for a correlation between Terms 1 and 3 (Eq. 7). Presumably such a correlation might arise if the phenotype is subject to assortative mating, which tends to induce positive LD between causal variants (Fisher, 1918; Crow and Kimura, 1970; Lynch and Walsh, 1998). In this case individual i's genotype at marker k is a weak proxy for i's genotype at ℓ, and the fact that i and j show a positive realized similarity at k (Term 1) may also mean that they tend to show similarity at markers k and ℓ (Term 3). However, because phenotypes subject to assortative mating are probably also subject to natural selection, which tends to induce negative LD (Lande, 1977; Bulmer, 1980), it may be that even assortative mating does not suffice to induce a correlation between Terms 1 and 3 large enough to invalidate GREML heritability estimates. This is perhaps an important issue for further research. where the definition of Sij is more or less retained from the univariate case. One complication is that the part of Sij corresponding to LD among distinct causal loci (Term 3) is defined to be part of the genetic correlation by some authors (Lynch and Walsh, 1998). If we ignore this complication and assume LE among causal loci, then the SNP-based genetic covariance will be estimated without bias by GREML if the markers that are nonzeros with respect to both traits are an effectively random sample of all genotyped markers. Furthermore, the GREML-estimated genetic correlation (the ratio of genetic covariance to the square roots of the genetic variances) may be close to unbiased as an estimate of the true genetic correlation under fairly general conditions, since biases attributable to missing causal variants and unrepresentative tagging of nonzeros may cancel from both the numerator and denominator (Trzaskowski et al, 2013). These issues may also be a worthwhile focus of future research. Our explication shows that GREML estimates of SNP-based heritability will be reasonably accurate under much wider circumstances than those under this approach has been previously derived. Such estimates are insensitive to the number, MAF spectrum, and coefficient magnitudes per se of the markers with nonzero regression coefficients. The sensitivity to the LD properties of the genomic regions containing the nonzeros, however, does raise some concern. This is the crucial question: how likely is it that the nonzeros of a given phenotype are effectively like a large and random sample of all genotyped (or imputed) markers with respect to tagging? is usually successful in removing most of any bias affecting an estimate based on the unadjusted A matrix (Eq. 5). When they applied the LDAK method to several real phenotypes, they found a tendency for the LDAK-corrected estimates to be larger than the standard GREML estimates (supporting the notion that causal loci tend to reside at low MAF), but these increases were modest and perhaps of little practical relevance to the issue of missing heritability. , the GREML method is quite robust. It should remain a valuable tool in quantitative genetics and gene-trait mapping research for some time to come. We thank Doug Speed and Xiang Zhou for answering our queries. This work was supported by the Intramural Program of the NIH, The National Institute of Diabetes and Digestive and Kidney Diseases (NIDDK). Assistance with phenotype harmonization and genotype cleaning, as well as with general study coordination, was provided by the Gene Environment Association Studies, GENEVA Coordinating Center (U01 HG004446). Assistance with data cleaning was provided by the National Center for Biotechnology Information.